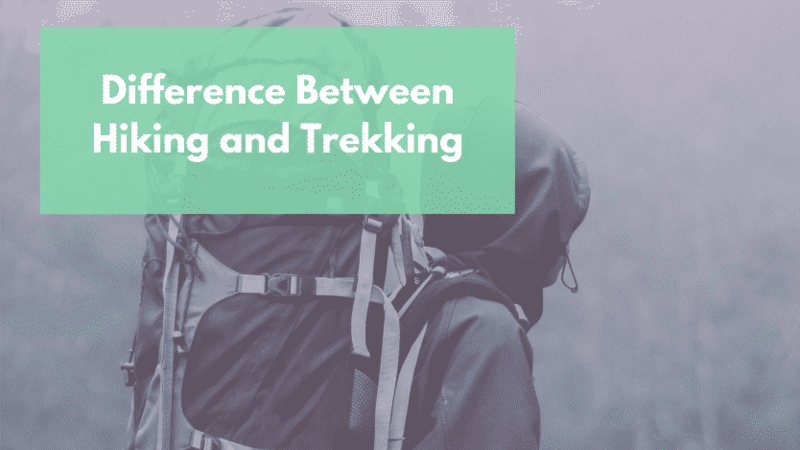 What’s The Difference Between Hiking and Trekking? Even though hiking and trekking have a lot of overlap they seem to attract a different crowd. Hiking is normally a little bit easier on the body, traveling through existing trails. So it tends to attract a wide variety of people with varying skill levels. Trekking, on the other hand, involves rough terrain where pathways are not always well marked. You need to build up some endurance before taking on some of these tough trails. Most hikers just want to spend some time in the outdoors. They organize trips solely for the beauty and joy of the outdoors. You’ll still get in a workout, but you probably won’t be drenched in sweat at the end of the day. Trekking is more of a walking challenge whereever the beauty of nature draws you. You can go high in the mountains, through untamed wilderness, and areas that aren’t mapped out. Most Hikes are planned as a day trip or a half-day adventure. Hiking offers you the opportunity to transgress easy inclines on hills and mountains or popular trails and roads that lead you to popular sites designated as short journeys. On hiking trips, you stop to take photos of the beauty around you, you stop to smell the flowers and admire Mother Nature before it is time to return back to your lodging for the day. When you decide to go hiking, you choose how fast you want to travel and what types of hiking trails you want to traverse. One day you might want to tackle a steep hillside and the next could be a leisurely stroll through a park. When you hike with great intensity it depends on the trail or trails you have chosen. Some trails are flat and other trails can feature hills and curves. Hiking doesn’t have to be intense, but you will be walking a lot. Beginners should stick to flat trails to get your body use to hiking. Over time your conditioning will improve and you can tackle those remote locations most of us never get to see. The most popular long hiking trail in the U.S. is the Appalachian Trail with turnaround trails that can show you natural beauty for hours. The American Hiking Society reports that throughout the U.S., hiking trails cover nearly all the 50 states and U.S. territories, totaling over 87,000 public trails. Trekking is basically a strenuous outdoor hike that lasts more than a day. Treks are planned for several days where camping is involved or you plan to spend nights at small huts, lodges, or bed and breakfast inns. Trekking is far more challenging than hiking because your trek journey means to walk through rough landscapes for as long as your adventure takes. It can be a short trip or extend for months, it’s really up to you. You don’t even have to camp outdoors if you aren’t up for it. Trekking culture varies from one country to the next with many different ways to plan your trip. Planned trekking adventures involve daily hikes over terrain that can surprise and amaze you every day. Preparing for trekking means to carry everything you will need for days and weeks at a time. Honestly, it’s all about semantics, one guys trek is anothers backpacking trip. However, when most Americans think of trekking, they think about foreign countries through the most challenging landscapes. Equipment for hike and treks will vary, but they obviously have some overlap. It doesn’t matter what type of trip you’re going on you need access to the same basic necessities. Think about all those little nuisance that you normally ignore on the trail. If you are hiking during the day when the sun is high, wear a hat, sunscreen, and eyeglasses. Even if you have a GPS it’s always a great idea to bring along a compass and trail map. Most state parks provide trail maps free of charge. I don’t care how good you are with a map, if you’re going deep into the wilderness get a GPS (check out my favorite unit). Hikers need to carry a small first-aid kit and plenty of water, food and snacks. Trekking requires the same types of equipment but additional supplies should include tents, sleeping bags and tools for a fire. On those long hikes don’t forget to bring along a pair of trekking poles. I’ve been using the same Black Diamond Trekking Poles for as long as I can remember. They aren’t cheap, but they’ll probably last longer than you do. Most trekkers are trained, experienced and have a general knowledge of the terrain they are traveling. You don’t just go on long treks without doing some serious planning. Long-distance trekkers can be challenged in a variety of ways during their adventure, so they must be well prepared and equipped. Before heading out you should know how to quickly and easily pitch tents and where to set up camp. You really need to be comfortable out in the great outdoors and away from civilization. Figuring out how to survive in nature doesn’t happen overnight. Here are a few of the dangers you’ll have to consider. On the other hand, hikers need to read the literature that is given when hiking through state or federal parks or along your local forest trails. Hikers must follow instructions, follow the directions of hiking guides, and stay on the trails. Day-long hikers often encounter other hikers, bikers, or horses. Be familiar with the trail rules regarding coming into contact with them to remain safe for everyone. Other Hikers: Incline hikers going upward typically have the right of way. Hikers are all friendly so there’s really no hard set rule it’s all about common courtesy. Bikers: Bikers generally have the right of way because they are moving faster. Simply move aside and let bikers have the right of way so you don’t get hit. Horses: Like coming upon bikers, horses naturally have the right of way. Give horses a wide berth when passing each other and don’t make any startling movements. You never know how a horse is going to respond. Dispose of your waste properly; use biodegradable soap for washing; do not leave trash, etc. Use established fire making equipment and keep fires to a minimum. Put out all campfires and scatter the ashes. Don’t leave trash in the firepit. Respect other visitors; camp away from visitors and trails; don’t make loud noises to annoy other visitors, etc.